Hire Skeeter Pro to spray your yard every 21 days to kill adolescent and adult mosquitoes before they bite you, your kids and your pets. Drain all standing water on your property. Cover trash containers so that water does not accumulate on the bottom. including at the base of planters. Change pet dish water frequently and water in bird baths at least once per week. Properly care for backyard pools and water filled landscaping accents. Trim trees and shrubs around sitting areas to eliminate mosquito resting places. Encourage your next door neighbors to hire the Skeeter Pro. Refer a friend or neighbor to a seasonal application and get one Skeeter Pro’s application free of charge. Mosquitoes are responsible for more human deaths than any other living creature. Mosquitoes pose a threat to public health, spreading everything from West Nile virus, encephalitis, dengue fever, malaria, and even heart worms in pets. One female mosquito may lay 100 to 300 eggs at a time and may average 1,000 to 3,000 off springs during her life span. The average life span of a female mosquito is 3 to 100 days and the male lives an average of 10 to 20 days. Only female mosquitoes bite—they need the protein for their eggs. The welt that appears after a mosquito bites is an allergic reaction to the saliv that is injected into your skin to prevent your blood from clotting. Light colors are less attractive to mosquitoes than dark colors; thus, mosquitoes are more likely to choose a victim wearing darker colors. Mosquitoes are found all over the world, even in cold places like the Arctic. 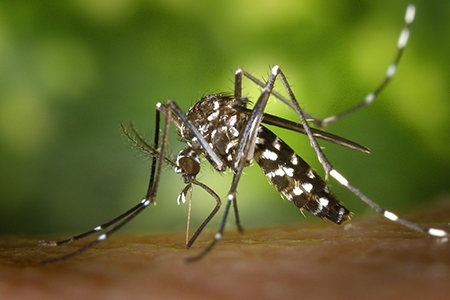 Mosquitoes prefer dark places like trees, grass and shrubs. Like humans, mosquitoes have food preferences—not all mosquito species bite humans, some prefer birds, horses, frogs or turtles.